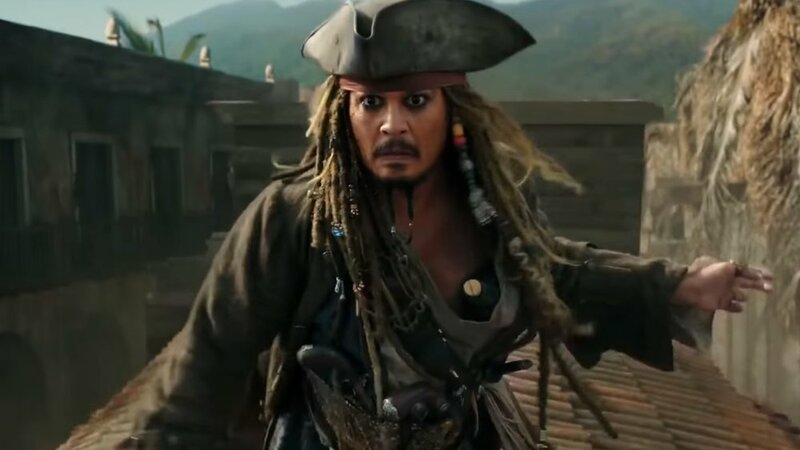 If you haven’t seen Pirates of the Caribbean: Dead Men Tell No Tales the reason to see this umpteenth installment, beyond normal morbid curiosity, is to study Johnny Depp’s portrayal of Captain Jack Sparrow throughout the film. Johnny Depp and Amber Heard’s divorce began during filming. While filming in Australia, Depp and Heard were still publicly in a relationship – even releasing a tongue and cheek apology video for flying their dogs into Australia. During this time, the scenes ‘at-sea’ were filmed. Captain Jack Sparrow is alive and well. Then, Heard filed for divorce from Depp and a circus of abuse allegations ensued. A production assistant sat outside Depp’s house waiting for the lights to turn on and would call the set to start working for the day. Depp is a method actor who had great personal issues which knocked him off his game. During these scenes, a decent actor is delivering all the expected Jack Sparrow quirks. Watching Depp’s performance change between scenes creates a whole new level of appreciation for acting. If you have watched it, or are in the position to reedit the film, here is my reconstruction of Pirates of the Caribbean: Dead Men Tell No Tales. My reconstruction eliminates about thirty minutes of unnecessary crap (jammed in because, historically, these were bankable elements for the studio), leaving the movie at a reasonable 1 hour and 30 minutes. Essentially, the film needs to focus on the new love story, Carina and Henry, as it had with Elizabeth and Will. The only characters that need real introductions in the movie are Carina and Captain Salazar. Gone are: any scene with the “real witch,” Henry’s childhood flashback (oh he’s Will’s son and he wants to rescue Will, that’s ten minutes we don’t need to see), Jack’s failed bank robbery (Jack is being a borderline competent pirate, loses his crew and is wanted by the British? That’s nothing I need to have explained to me for fifteen minutes), Henry’s visit to prison, and the wedding on the not-so-deserted island. The audience learns Salazar’s origin story, more of Jack’s origin story, and about the curse on the compass “if you betray it.” It shows a lot of information the audience needs to know for the films plot and Javier Bardem’s narration is sublime. Carina escapes prison. Carina encounters Jack. Henry is first seen being held as a traitor in the hospital. (The audience never sees Henry aboard a naval ship.) The reprimanding officer throws in a line saying something about Henry Turner being a son of a pirate. Carina comes to Henry. Carina’s quest for the trident and her father are introduced. Carina fleas telling Henry to rescue her. After a failed (off screen) robbery, Jack’s crew abandons him. Jack trades the compass for a drink. Cut like thirty seconds of special effects of the compass “trembling on the table” interspliced with “Salazar looking sad into the distance,” because now the audience knows the stakes for trading the compass or at least the connection between the compass and Salazar. Now when Salazar says “Jack Sparrows gave away the compass!” it feels authentic rather than a last second script change to explain what just happened. Whatever. Probably should have developed Carina’s backstory better instead of requiring all of her scenes to revolve around Jack’s 15-minute-long failed robbery. He’s living a life of luxury. Pirates are being hunted. Barbossa is savvy to the whole Salazar/Jack compass connection. Henry can witness it. Perhaps it gives him the idea to hire Jack’s crew. But Henry can’t go talk to Jack in jail. Firstly, it re-explains the motivations the audience knows. Secondly, why is Henry in prison with Jack and Carina without trying to rescue either? (Henry is there for three minutes in the film; that’s a really long scene comparatively) And finally, Johnny Depp is clearly going through his divorce and isn’t carrying the scene as the audience would expect. Goes well. Carina fight with Jack. Makes me like ‘em both. The action sequence is much more gratifying and authentic feeling than the safe robbery. Henry jumps in as diversion: His skills as a fighter can be proven here (ala Will Turner sword fighting Jack Sparrow), since we eliminated his fight aboard the naval ship. Jack’s told Henry hired Jack’s crew to save Jack to find the trident. Or Carina’s last words mention her trident quest. Whatever. Carina and Henry have awesome chemistry as Henry holds her up – saving her from the noose. Jack and Crew take Carina and Henry hostage. Awww like Elizabeth and Will in the first movie. “Prepare to sink” is a great line. Bickering between Carina and Henry, adorbs. Jack tries to get information from Carina and fakes killing Henry to get it. Scene works. No witch scene. Why would the British enlist a witch in their quest to capture and kill a witch? The minute is appropriated to show the British setting out to capture Jack… sort of like in the first one but now the British want to kill Jack’s female prisoner rather than marry her. Jack’s fled like six hours prior in a ship called the “Dying Gull,” I bet the British navy can catch up. Jack screws with Henry’s and then Carina’s heads. Carina confides in Henry. Clearly they love each other and just don’t know it yet. Barbossa has the compass that will lead Salazar to Jack. He can make the accord with Salazar to catch Jack by sunrise without knowing where Jack’s going. Carina actually does math stuff rather than just talking about being “educated.” Horologist exchange is amusing. Did Elizabeth and Jack end up stranded on an island that Jack had some weird connection to? The island stranding works, Jack’s weird connection to the island does not. Perhaps Jack has another rum stash here because he gets in these types of hijinks all the time. But no random village. Whatshisface (Jack’s occasional first mate) quickly pawns off being “captain” on an ignorant pirate. Fun. Let them find her any other way than being captured by people. Maybe there’s alligators and she’s stuck in mud surrounded. Whatever. Things other than people are dangerous. Perhaps they don’t catch up with her until later. Maybe Carina gets a meaningful scene alone? She did just find out ghost pirates exist and is stranded on a desert island. Nah, I’m sure Carina’s fine. Telling where the treasure buried is a cute exchange. Barbosa barters with Salazar to go on land to capture Jack. A comedy of errors makes Jack and Henry believe Carina’s in danger. (Perhaps Carina has grabbed a sword and is klutzy and it looks like she’s fighting Barbossa when he was just showing her how to hold it.) Jack and Henry jump in to save Carina. Carina shames them and gets them to apologize for presuming she needed rescuing (it’s parallel to Jack forcing his crew to pay to save him and Carina forcing Henry to apologize to her later). There’s no village forcing Jack to marry a homely woman. Jack’s crew escapes from the brig. They use anything other than a gross toe nail to do it. Because Hell yes. And, Carina and Henry banter. She makes him apologize to her. Much chemistry. In five minutes the Brits spot the Black Pearl; so, they really were practically next to each other. Since I’m choking on the sappiness being shoveled down my throat, Barbossa should not be Carina’s father. Rather, Barbossa also gave up a child (a boy perhaps) that Jack knew about and “Smyth” is a pirate surname. 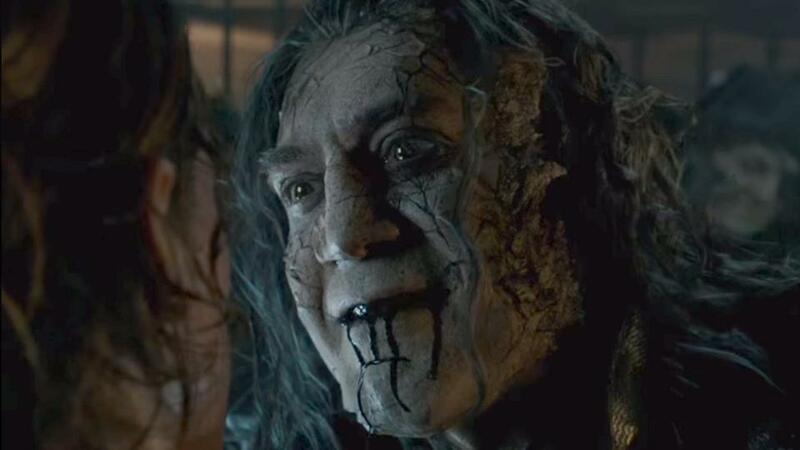 Barbossa is invested in Carina as a pirate orphan since his long-lost child is a pirate orphan. Barbossa knows the book because he’s a pirate and it is treasure. He knows Carina is the name of the brightest star again because, again, he is a pirate. This way instead of Carina’s father “mystery” getting resolved almost instantly, the next film of “Carina searching for her pirate father” is set up. Just like the second movie was about Will Turner looking for his father? I don’t know; seems like a workable aspect of the “formula” that a “soft reboot” would want to maintain. 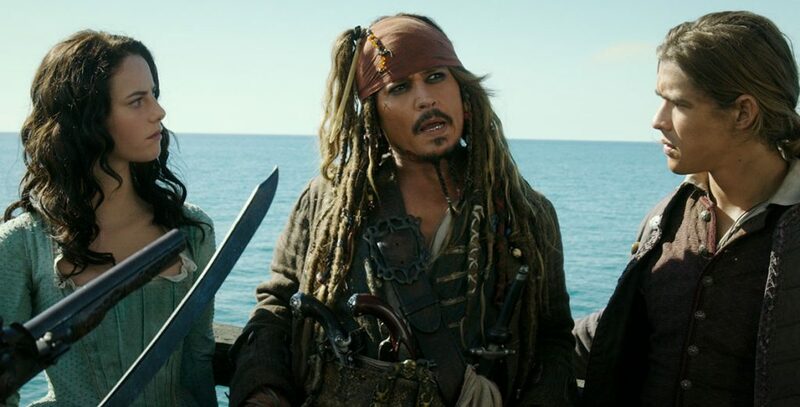 Jack and Barbossa converse about how Carina’s father is clearly a pirate. Jack plays on Barbossa’s guilt for giving up his own child. Establishes Barbossa’s paternal-eqsue feelings for Carina. Guilt is a much greater motivator when one cannot actually make it up to the party they’ve wronged. Whacky Jack fight. Salazar gets Henry. Good ol’ Pirates fun. The ship runs a ground. The stone from Carina’s dairy parts the sea when replaced. Makes a lot more sense without Barbossa knowing anything about Carina and the dairy because he was super useless in the current version. Salazar possesses Henry to attack Carina and friends. It’s nice to put the main characters’ love to the test with a fight between the two of them while one is possessed. Blah blah blah. I just am annoyed that they walked to the trident in a time frame that wasn’t worth showing (rather than, say, the walk to Mordor) but once the parted ocean begins to collapse they looks miles from any dry land. Is walking in corsets easier than running in sneakers? Because damn girl you got there fast. But with like way way way less conversation about it. Like the parted sea is collapsing on itself and they’re climbing an anchor to not drown, but they spend an eternity showing Carina realize Barbossa is her father. Again #forced. This entry was posted on Friday, June 29th, 2018 at 11:30 am	and is filed under Film, News. You can follow any responses to this entry through the RSS 2.0 feed. You can skip to the end and leave a response. Pinging is currently not allowed.